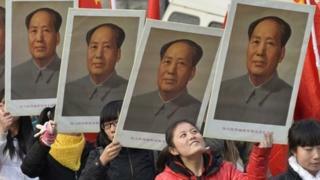 The controversial legacy of Mao Zedong is back in the public eye ahead of his 120th birth anniversary on Thursday. Mao, one of the founders of the Chinese Communist Party, was one of the most influential thinkers of the 20th Century, but his legacy continues to divide opinions. After he launched the Cultural Revolution (1966-1976), millions of people were forced into manual labour and tens of thousands were executed as counter-revolutionaries. The mainland Chinese media have mostly been playing down news of various activities that were staged in some cities over the weekend to commemorate the birth anniversary. But over in Hong Kong, the Apple Daily says "Mao fans" staged rallies in Beijing, Shanghai and Guangzhou, as well as smaller cities further inland such as Nanchang and Taiyuan. On Saturday, students and teachers from the Taiyuan University of Science and Technology carried portraits of Mao and shouted "Swear allegiance to Mao Zedong", "Mao Zedong is our only centre" and "the Cultural Revolution is back", the paper says. Students also reportedly recited poetry in homage to Mao, while others danced and sang: "China has Mao Zedong, he is the people's great saviour!" Mao impersonator Zhang Ruiqi even mimicked the late helmsman's voice to deliver a speech during the rally. However, one local dissident suspects that the rally was staged deliberately by certain groups for political ends. "Some of them are Mao leftists and some are the black hand of the authorities fanning the flames behind the scenes and exploiting the ignorance of young people to achieve their political goals," Deng Taiqing tells the Apple Daily. The Apple Daily also voices dismay at the revival of Mao fever and accuses Ai Yuejin, a "leftist" professor at Tianjin's Nankai University, of "whitewashing" the Cultural Revolution. "During the Cultural Revolution, there was a satellite space launch, a successful missile test and a nuclear submarine launch. During the Cultural Revolution, we defeated Soviet revisionism, entered the United Nations and established diplomatic relations with more than 60 countries," Prof Ai said in a lecture at the Taiyuan University of Science and Technology last week. Prof Ai added: "Were these 60 countries fools for establishing diplomatic relations with a country in catastrophe?" The nationalist Beijing newspaper Global Times defends Mao's mistakes and achievements, saying revolutions usually have a brutal side and that it is impossible to judge Mao's Communist revolution, and its excesses, from a "humanitarian perspective". "The belief that Mao Zedong is already 'discredited' in Chinese society is just a naive fantasy... A number of people are engaged in activities to dig away at China's political foundations in the name of historical debate. They should be resisted by Chinese mainstream society," it says. Meanwhile, concern over increasing volatility in mainland society is another key theme in Monday's media. A 53-year-old courier tricycle driver set himself alight with petrol after he was stopped by police officers for alleged traffic violations in Tangshan, Hebei province, on Saturday. The driver also tried to grab a police officer after setting himself alight. The two were later sent to a hospital with burns. Writing on news website Red Net, commentator Qiao Zhifeng casts doubt on the local police's account that the driver had intentionally planned the self-burning to show "discontent" because he had been pulled over by traffic police many times for similar violations. "In a normal, harmonious society, how could someone vent 'discontent' through self-immolation? Social wealth is unequal, the gap between rich and poor is widening, corruption is myriad, social justice is frequently trampled upon, and social moral standards keep sliding downwards. "If these deep-seated problems are not resolved, 100 ill-effects will arise, and if things go on like this, it will bring a greater threat of instability to society," he warns. Meanwhile, the Southern Metropolis Daily recounts a common tragic occurrence in China: Villagers taking their own lives to resist government land grabs. It recalls how a villager in Zhenghe County, Fujian province, set himself alight with petrol on 14 December after he was held back by relatives from throwing himself in front of the bulldozer of a demolition crew. And Hong Kong's Oriental Daily News notes that a woman in Jiaozuo, Henan province, committed suicide on Friday by ingesting pesticide after authorities forcibly demolished her business establishment, describing it as an "illegal construction". "Recently, the mainland has repeatedly had cases of people risking their lives to safeguard their rights... This proves that high-pressure stability maintenance cannot bring social harmony and it will only lead to more intense resistance. Society now is like a gunpowder keg and a single spark is enough to ignite a massive fire," it says.